You want to see your windows spotless without squandering time, energy and much money? You can succeed in this now – just let the specialists of window cleaning in East Dulwich take care of this task for you. We will make sure that all parts of your windows are in perfect state – glass surfaces, framework and window ledges. You can rest assured that your property is managed with great care. Go and use your time for free more essential. assignments this is not all – the But to chance will come to you save time and efforts with along many. We also provide our professional services in nearby areas: Forest Hill, Sydenham Hill, Nunhead, Peckham, Catford. With our professionalism and technical expertise, you can rely on us for domestic and business window cleaning. Your house will look pristine after the work is done, it doesn't matter what kind of windows you have. We thoroughly wash small, double or sash windows, French doors, bay windows and patio doors. Moreover, we clean skylights, garden windows and greenhouses. In other words, you can rely on us for flawless cleaning of your windows, including the framework and sills. We are glad to use the best methods to make sure that you get the finest window cleaning. The glass surfaces of your house are going to look spotless after we use water-fed extension pole cleaning system and high pressure cleaning on them. We use our trucks to supply the poles with water and we can reach as high as the fourth floor. In case you request polishing of highly-placed windows, we have rope access window cleaners ready to go. Call us on 020 3746 3113 and get in touch with us – these efficient techniques will bring you results in no time. With our experience and expertise, the marvellous look of your property will be noticeable swiftly – the specialists of commercial window cleaning will deal with this matter. 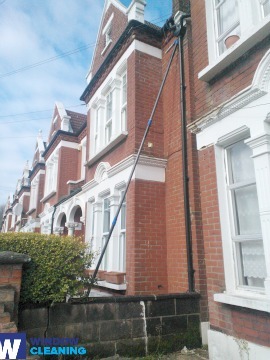 We use water-fed extension pole system for quick and well organised window cleaning, up to the fourth floor. For office buildings taller than that, we use up-to-date rope access methods. With this equipment, we are prepared reach the highest glass panes, even on the skyscraper-sized buildings London is so popular with. From small shops to towering business scrapers, we ensure excellent services – call, now! The experts of window cleaning in East Dulwich will revive your house. We deliver excellent window cleaning services in East Dulwich. Our procedure includes water fed extension pole system and also jet washing. We guard your health and safety with non-toxic detergents and purified water. Join our satisfied purchasers – dial 020 3746 3113 and get in touch with our customer support centre. You can also request our services online – just fill in our special form or use our chat feature.